Every little boy who had the dream of playing better than the other boy wanted to go to Auer. He was a very gifted man and a good teacher. I used to go to the Conservatory twice a week for classes. I played every lesson with forty or fifty people sitting and listening. Two pianos were in the classroom and a pianist accompanied us. When Auer was sick, he would ask me to come to his home. 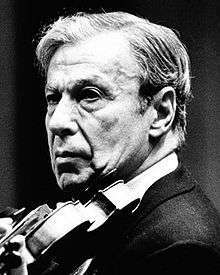 Milstein may in fact have been the last of the great Russian violinists to have had personal contact with Auer. Auer did not name Milstein in his memoirs but mentions "two boys from Odessa ... both of whom disappeared after I left St. Petersburg in June 1917." Neither is Milstein's name in the registry of the St Petersburg Conservatory. Milstein also studied with Eugène Ysaÿe in Belgium. He told film-maker Christopher Nupen, director of Nathan Milstein – In Portrait, that he learned almost nothing from Ysaÿe but enjoyed his company enormously. In a 1977 interview printed in High Fidelity, he said, "I went to Ysaÿe in 1926 but he never paid any attention to me. I think it might have been better this way. I had to think for myself." Milstein met Vladimir Horowitz and his pianist sister Regina in 1921 when he played a recital in Kiev. They invited him for tea at their parents' home. Milstein later said, "I came for tea and stayed three years." Milstein and Horowitz performed together, as "children of the revolution", throughout the Soviet Union and struck up a lifelong friendship. In 1925, they went on a concert tour of Western Europe together. He made his American debut in 1929 with Leopold Stokowski and the Philadelphia Orchestra. He eventually settled in New York and became an American citizen. He toured repeatedly throughout Europe, maintaining residences in London and Paris. A transcriber and composer, Milstein arranged many works for violin and wrote his own cadenzas for many concertos. He was obsessed with articulating each note perfectly and would often spend long periods of time working out fingerings which would make passages sound more articulated. One of his best-known compositions is Paganiniana, a set of variations on various themes from the works of Niccolò Paganini. In 1948, his recording of Felix Mendelssohn's Violin Concerto in E minor, with Bruno Walter conducting the New York Philharmonic, had the distinction of being the first catalogue item in Columbia's newly introduced long-playing twelve-inch 33 rpm vinyl records, Columbia ML 4001. He was awarded the Légion d'honneur by France in 1968, and received a Grammy Award for his recording of Bach's Sonatas and Partitas in 1975. He was also awarded Kennedy Center honors by US President Ronald Reagan. A recital he gave in Stockholm in July 1986 proved to be his final performance. This recital was recorded in its in entirety and shows the remarkable condition of his technique at age 82. A fall shortly afterwards in which he severely broke his left hand ended his career. After playing many different violins in his earlier days, Milstein finally acquired the 1716 "Goldman" Stradivarius in 1945 which he used for the rest of his life. He renamed this Stradivarius the "Maria Teresa" in honour of his daughter Maria (presently wife of Marchese GiovanAngelo Theodoli-Braschi, Duke of Nemi and Grandee of Spain, descendant from Pope Pius VI) and his wife Therese. He also performed on the 1710 ex-"Dancla" Stradivarius for a short period. During the late 1980s, Milstein published his memoirs, From Russia to the West, in which he discussed his life of constant performance and socializing. Milstein discusses the personalities of important composers such as Alexander Glazunov, Sergei Prokofiev, Sergei Rachmaninoff and Igor Stravinsky and conductors such as Arturo Toscanini and Leopold Stokowski, all of whom he knew personally. He also discusses his best friends, pianist Vladimir Horowitz, cellist Gregor Piatigorsky and ballet director George Balanchine, as well as other violinists such as Fritz Kreisler and David Oistrakh. Milstein was married twice, remaining married to his second wife, Therese, until his death. He died of a heart attack in London on December 21, 1992, 23 days before his 89th birthday. ↑ High Fidelity, November 1977, 84, 86. As quoted in Schwarz, 443. ↑ Auer, Leopold, My Long Life in Music, 343–344. As quoted in Schwarz, 443. ↑ High Fidelity, November 1977, 86. As quoted in Schwarz, Boris, Great Masters of the Violin (New York: Simon and Schuster, 1983), p. 444.